Sony has come up with new cheaper Happy India plans. 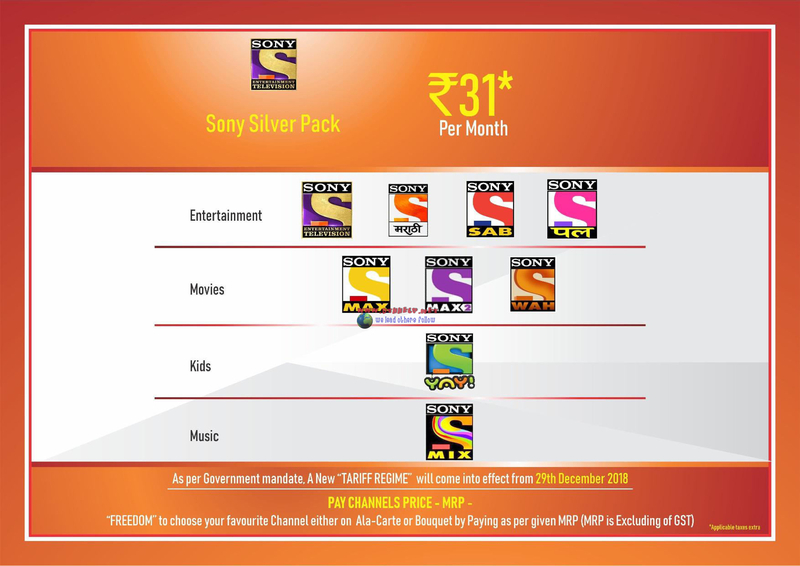 Now Sony is providing more variety of channels on its Happy India packs. These channel lists and prices are different from earlier ones. Earlier Sony was providing four types of Happy India packs. Platinum, Premium or Gold, Silver and Sixer packs. The newer pack now has more choices. They have separated English & Sports channels from Hindi channels. Earlier Hindi channels used to be bundled with English channels PIX, Sony Earth & AXN. Le Plex HD channel has been removed from English channels list. Happy India English pack which has 3 channels on it and is costs Rs.12 per month. 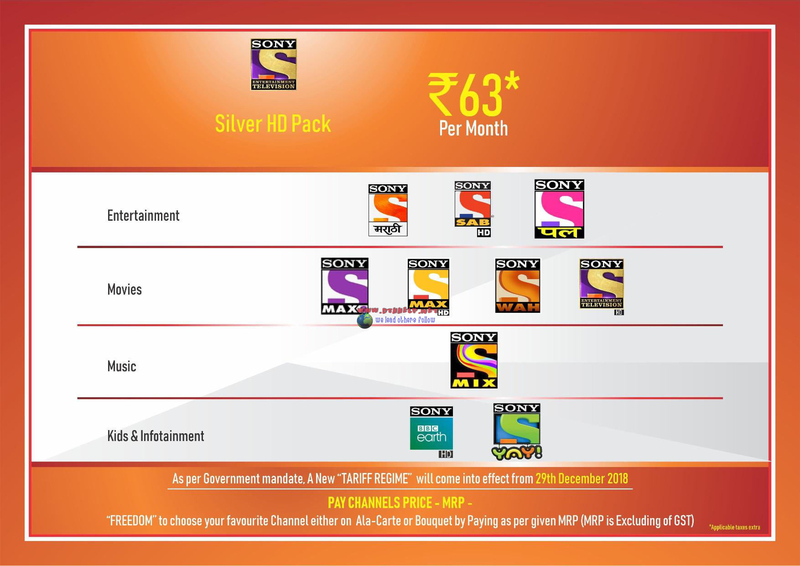 Happy India pack HD costs Rs.90 per month. Totally three packs are targeted for South India. 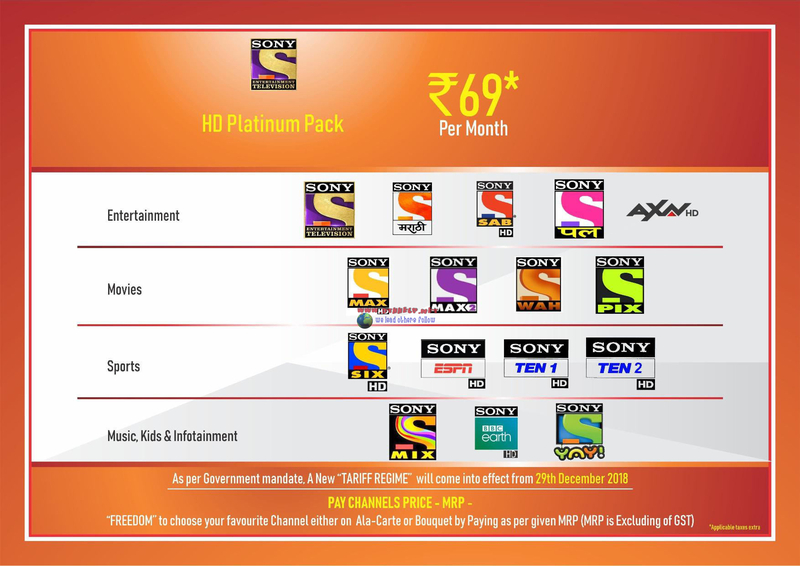 Happy India South Football pack costs Rs.33 per month with BBC Earth, Six, Yay, Axn, Pix, Sony, Wah, Max 2, Mix & Ten 2. Happy India Platinum South priced at Rs.35 and it has BBC Earth, Six, Yay, Axn, Pix, Sony, Wah, Max 2, Mix & Ten 1. Happy India South costs Rs.19 per month and has BBC Earth, Six, Yay & Ten 1. Other packs from Sony are Bangla and Marathi. 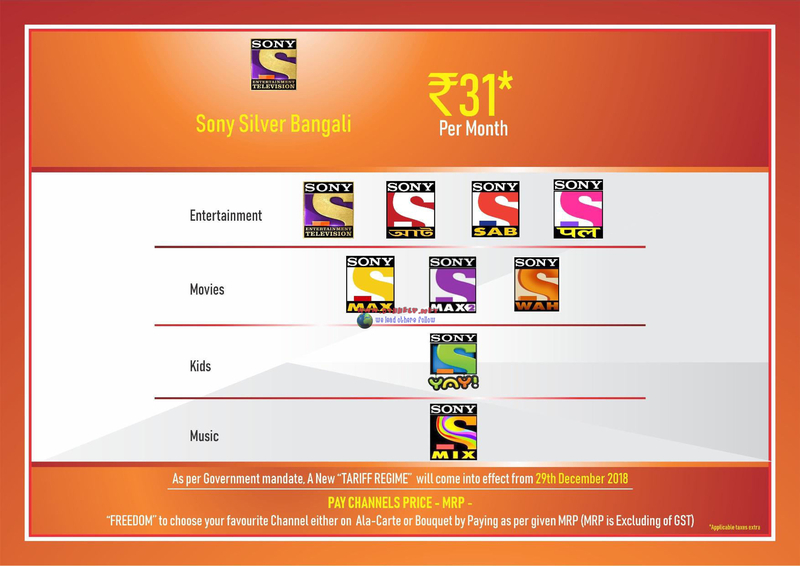 Marathi pack has Sony Marathi channel included and Bangla has Sony Aath channel. Happy India Sports+English costs Rs.47 per month and it has Axn,Pix, BBC earth, ESPN, Six, Ten 1, Ten 2 & Ten 3. Sports + English HD costs Rs.50 per month and it contains Axn HD, Pix HD, BBC Earth HD, Espn HD, Six HD, Ten 1 HD, Ten 2 HD & Yay. Happy India English costs Rs.12 per month and it has Axn, Pix & BBC Earth. Happy India English HD priced at Rs.20 per month and it has Axn HD, Pix HD & BBC Earth HD. Happy India costs Rs. 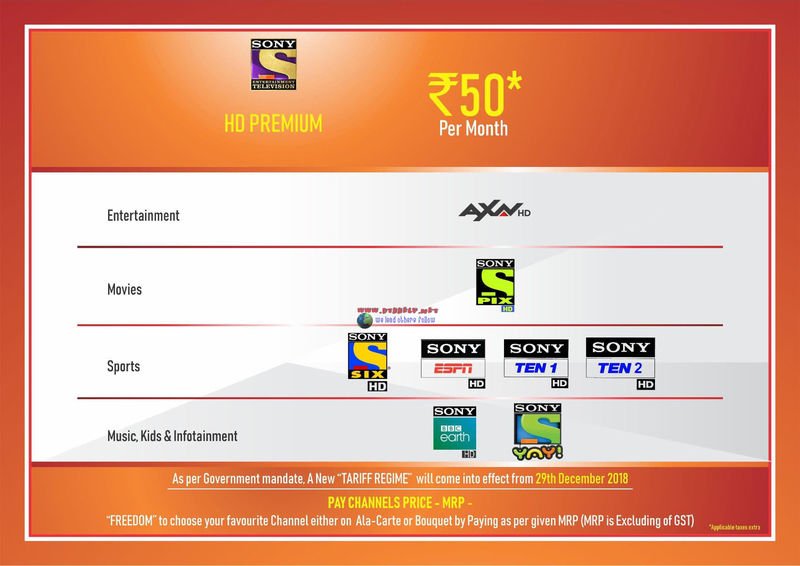 31 per month with Sab Tv, Set max, Sony, Max 2, Mix, Pal, Wah & Yay. Happy India HD will cost Rs.59 per month and it has Sab HD, Max HD, Set HD, Max 2, Mix, Pal, Wah, yay, BBC Earth HD & Marathi. Happy India Platinum HD will cost Rs.100 per month and it has Sab HD, Max HD, Set HD, Max 2, Mix, Pal, Wah, Yay, BBC Earth HD, Espn HD, AXN HD, Pix HD, Six HD, Ten 1 HD, Ten 2 HD & Ten 3 HD. Three sports packs are available on Sony. One pack costs Rs.39 and it has all sports channels and other pack costs Rs.31 and it has all sports channels except Ten 3. There is a third pack for sports lovers. This pack is called Football pack and it has two channels and costs Rs.17 per month. Happy India Sports + English pack costs Rs.47 per month and has Espn, Six, Ten 1, Ten 2, Ten 3, BBC Earth, Pix & Axn. 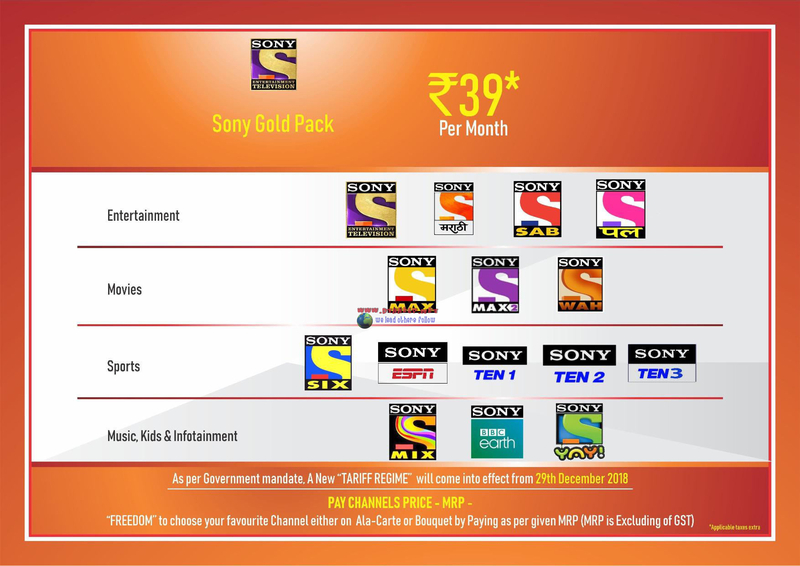 Happy India Sports pack costs Rs.39 per month with Espn, Six, Ten 1, Ten 2 & Ten 3. 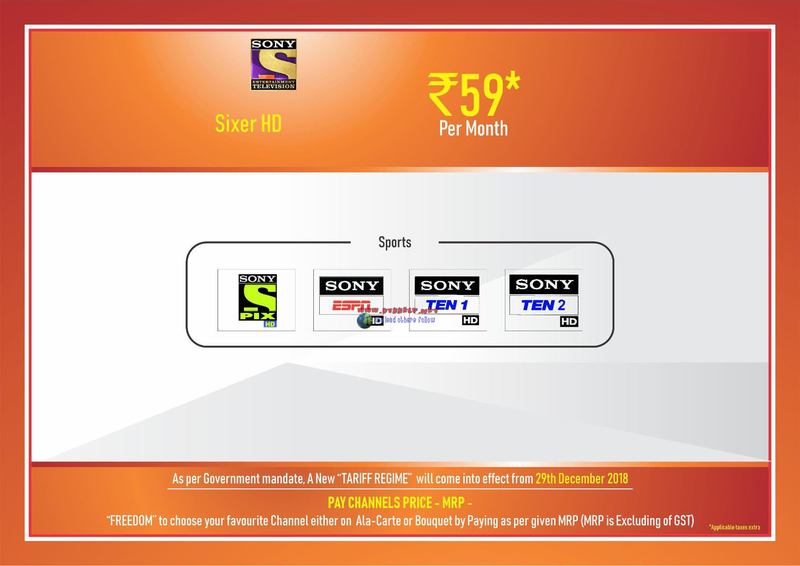 Happy India Sports and it costs Rs.31 per month and it has Espn, Six, Ten 1 & Ten 2. Happy India Football pack will cost Rs.17 per month and has Six, Ten 2, BBC Earth & Yay. Happy India Sports HD pack costs Rs.48 with Espn HD, Six HD, Ten 1 HD & Ten 2 HD. Happy India Sports HD and this pack costs Rs.59 per month. It has ESPN HD, Six HD, Ten 1 HD, Ten 2 HD & Ten 3 HD. Happy India Sports + English HD costs Rs.50 per month and has Espn HD, Six HD, Ten 1 HD, Ten 2 HD, BBC Earth HD, Pix HD, Axn HD & Yay. There are some more packs available from Sony Network.